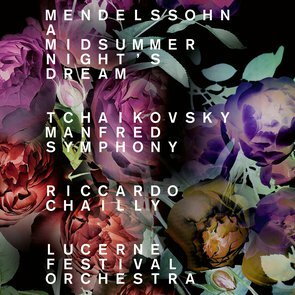 Im August 2017, during his second summer as Music Director of the LUCERNE FESTIVAL ORCHESTRA, Riccardo Chailly devoted himself to a pair of classic works that had never previously appeared on the programs of this top-class ensemble. Felix Mendelssohn “translated” Shakespeare’s immortal comedy Midsummer Night’s Dream into music, dancing elves and wedding march included. In his Manfred Symphony, Pyotr Ilyich Tchaikovsky meanwhile turned to the titular anti-hero created by the English Romantic Lord Byron. The live recording of this thrilling concert of two works of world literature set to music is now available on DVD.